During the trip orientation in Pharr, teams based in the Rio Grande Valley visited the National Butterfly Center, which will be affected by the next stage of border wall construction near Mission. 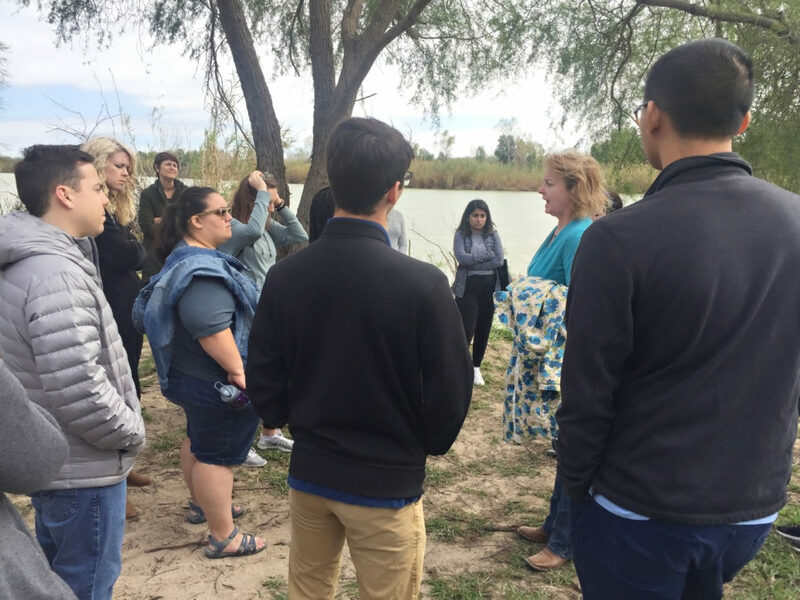 National Butterfly Center Executive Director Marianna Trevino-Wright talking with students on the bank of the Rio Grande River. Mexico is on the opposite side. 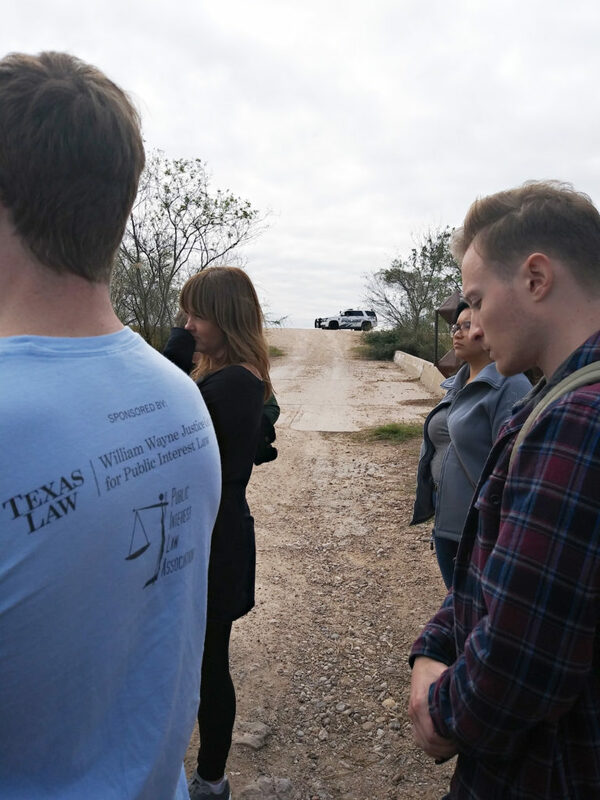 Dozens of students, faculty, and staff spent the last week of winter break on Texas Law’s tenth annual Pro Bono in January trip to South Texas, organized by the Richard and Ginni Mithoff Pro Bono Program. In past years, the trip has focused on the border region, but this year the trip expanded in size and geographic scope. After two days of orientation activities and training, 73 students organized into 8 teams spread across the region, from San Antonio to the Rio Grande Valley. Eighteen students worked with nonprofits to assist immigrants in detention. The Karnes Team worked with RAICES and Texas Law Immigration Clinic professors to assist adult immigrants detained with their children in the Karnes Family Detention Facility in Karnes City. The Pearsall Team worked with RAICES to assist adult immigrants detained in the South Texas Detention Complex in Pearsall. And the ProBAR Team worked with ProBAR’s office in Harlingen to assist adult immigrants detained in the Port Isabel Detention Center. Ten students spent the week assisting rural public defenders. The Rio Grande City Team worked with Texas RioGrande Legal Aid’s (TRLA) regional public defender office in Rio Grande City to assist clients charged with criminal offenses in Duval, Jim Hogg, and Starr counties. The Beeville Team worked with TRLA’s regional public defender office in Beeville to assist clients charged with criminal offenses in Bee, Live Oak, McMullen, and Refugio counties. Mithoff Program Director Andrea Marsh and students Ana Ibanez ’21 and William Cozzens ’20 touring the National Butterfly Center. 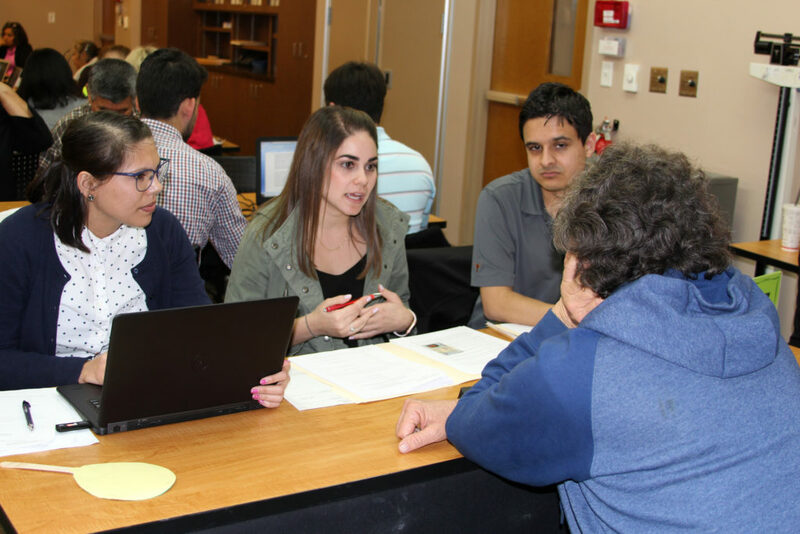 The Clinics Team, thirty-five students headquartered in Pharr, worked on a variety of projects in partnership with TRLA and local volunteer attorneys. They helped prepare wills, transfer on death deeds, and homestead tax exemption applications for 105 homeowners in Cameron and Hidalgo Counties. 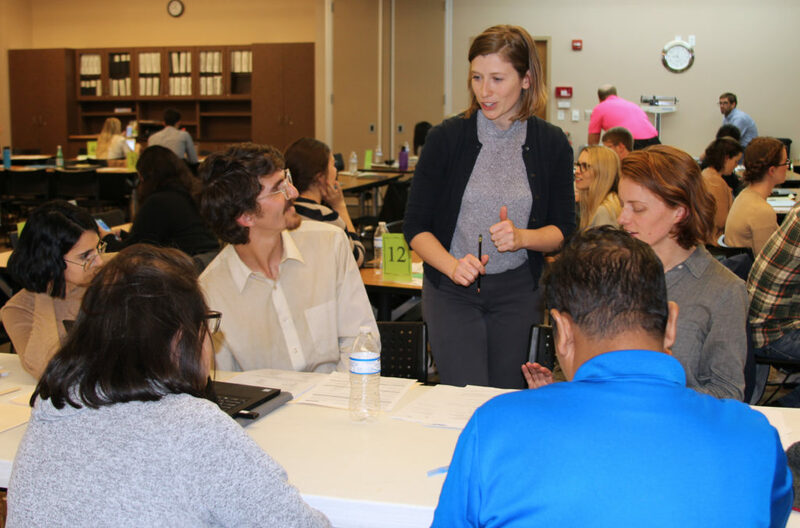 At the Region One Education Services Center in Edinburg, the team counseled over 50 young adults with disability and their families about alternatives to guardianship and, in some cases, helped them draft supported decision-making agreements. In partnership with the Texas Fair Defense Project, the Clinics Team also hosted a Driver’s License Recovery Clinic in San Juan. Students met with almost 100 drivers with license holds, researched their license suspensions, and explained steps to recover their licenses, which often included obtaining a fee waiver, fee reduction, or alternative payment plan. In many cases, students also helped attendees complete financial affidavits in support of requests for fee relief. Ten students worked on cases in the offices of partners in the Rio Grande Valley. The Edinburg Team assisted lawyers in TRLA’s general-practice Edinburg office, working on disaster recovery, immigration, and criminal cases. 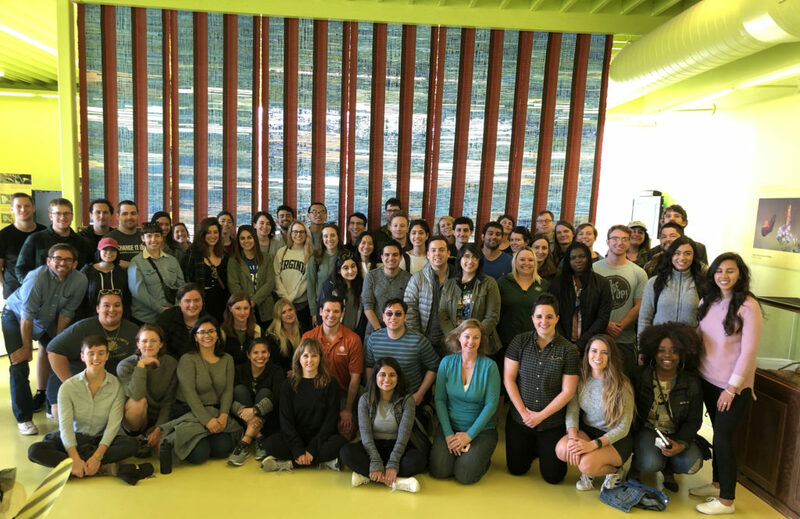 The Texas Civil Rights Project’s Racial and Economic Justice (REJ) Program in Alamo hosted the TCRP Team, which did legal research related to border wall and civil rights litigation. Jessica Villalon ’21, Nick Sawyer ’21, TRLA attorney Eva Sikes ’18, and Laura Tucker ’20 consult about a will during the Homestead Preservation Clinic in Brownsville. Paige Melendez ’20, Claudia Socias ’21, and Ruben Cardenas ’20 meet with a homeowner at the Homestead Preservation Clinic in Brownsville.